mattsnellmusic.com: New Moondog Album Released! 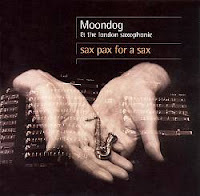 I'd heard Moondog before, but I think this was the first Moondog c.d. I actually owned. Moondig really might be an antidote for grumpiness, and I kind of like your idea about making this mandatory listening for people. In fact, I'm going to do my part by making my 8th graders listen to it during some quiet writing time this week. Good man! The Moondog Effort needs more like you.